There is very little difference between what Hansen is doing and the old time soothsayers. Sure Hansen has computers with which to ply his magical tricks of math and dead tree entrails are at the core of his “dire doomsday” climate predictions. It’s the same old confidence game just different means of deception. When a “theory” (actually a hypothesis, well not even that as a hypothesis needs to have proper tests that would falsify it should the tests fail to validate the hypothesis) fails to “connect” with objective reality it’s no longer a theory and it’s repugnant to science call it that. At best it’s a failed hypothesis and more likely just another pile of steaming mind poop that needs to be shoveled into the dust bins of history, just like millions of other failed hypotheses in the meandering progression of hard science. Objective Reality is a Harsh Mistress ™ and she is very unforgiving. 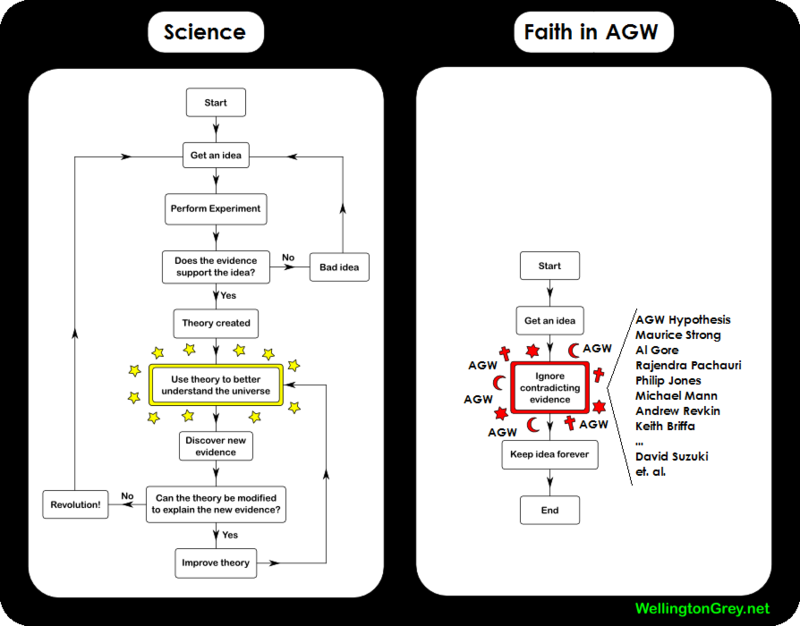 The current problem with so called climate science is that it’s not a hard science anymore. It’s gone limp with wild agenda driven speculations taken as if they are what is happening in objective reality without the hard science to back it up. Sure they have instruments and gauges and satellites and what not that can record data so thus it seems like hard science. Unfortunately the instruments is where the tiny bit of hard science in climate science ends. It’s at the point after data collection that the hard goes limp and we end up with the wild agenda driven speculations jokingly and tragically called a “theory” as if it was true. Objective Reality is a Harsh Mistress ™ as Hansen, Mann, Jones, et. al. are finding out the HARD way. Keep up the work insisting that climate science become a hard science again with Publicly Open Source Analysis, Auditing and Verification Processes where anyone with the skills can Peer Review and Audit and Verify or Falsify it. Part of what makes a hard science hard is the rigorous auditing and verification and testing against that harsh mistress of Objective Reality. A hypothesis or theory is ultimately only a map of objective reality. We need to make sure that we have the best map possible for the climate of Earth in order to ensure or maximize the odds of the survival of our species. Geo-engineering terrorfroming our one Earth based on junk science is not going to achieve that. Hard science that is verified and then verified again hundreds of times is what is needed. Hansen, you soothsayer of doom, you’re fired. This entry was posted on February 3, 2010 at 6:38 am	and is filed under Avoiding Quesitons, Bad Science, Bad Science Attitude, Belief Stricken, Caustic Scientists, Climate Science, Climategate, Complex Systems, Conspiracy Theory, Debunking Bad Environmentalism, Disasters, Dupenhagen aka Copenhagen 2009, Eco-Junk Science Terrorists, Ethics in Science, Get some perspective people, Hard Science Required, Holding those who run the world responsible for their crimes against humanity, Humbled by Nature, Ignorance to Knowledge, Rational Thinking, Reality Based Economics, Reality Based Environmentalism, Scams, Science over Propaganada, Science Smackdown, Something to think about. You can follow any responses to this entry through the RSS 2.0 feed. You can leave a response, or trackback from your own site.